I’ve said this quite a bit lately, but it often amazes me the absolute vastness of the metalsphere. I have been a pretty avid follower/collector/worshipper since the early 80’s and for a “band” to sneak in to our digital promo folder that impresses, only to find out they have a catalog of music that looks like a family of 6’s grocery list, it makes me feel like I have indeed fell out of step with the happenings in our beloved genre. I realize it’s nearly impossible to keep up anymore, but Neige et Noirceur has produced 17 releases in one form or another since 2005? 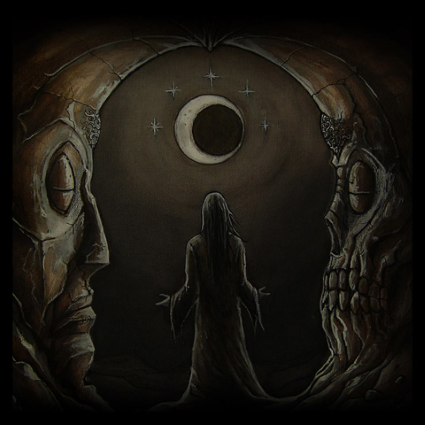 Granted the Quebec black metal genre feels a little more enshrouded in mystery than say their Scandinavian counterparts for example, it’s a good thing that the ambitious and excellent Sepulchral Productions is here to unlock the treasures residing in the Great White North. Gouffre Onirique et Abîmes Cosmiques, the 4th proper full-length by Neige et Noirceur, on the surface is your standard dissonantly aggravated harsh black metal fare. Thankfully it doesn’t take long for very effective/interesting elements and a vibrant sense of depressive melody to arise from the coherent storm of audial frost. With a delivery that centers on plodding mid-paced tempos and melodically bloated structures, it’s impossible to evade the memorable riffs that keep arising out of the chilling guitar tone that aids in keeping this recording eternally melancholic. Sole songsmith Zifond has a definite ear for taking in decades of black metal influence and spewing forth such a gifted and effective collection of songs that do share an aura of sameness, but offer just enough memorable content and needed applications of speed that the constant pull of this material takes on a hypnotic journey into the dark side of one mans creativity. Malevolent screams are Zifond’s core delivery and it suits this style of mysticism perfectly. The atmosphere is further stirred by subtle though effective synths that put me in mind of the excellent Evilfeast. Mix this with an obvious appreciation for Burzum’s Hvis Lyset tar os as instantly noticed on the dreamlike intro/title track and you have a well rounded album that endlessly hails its influences, while forging on into the great vast forest without the aid of a guide. Well I like some Midnight Odyssey tunes and a lot of Evilfeast ideas…so I bought the previous Neige et Noirceur full length album—Hymns…—hoping the consistency/arrangements are a bit better than those bands. The song you posted is quite good. The album I got is 45 minutes, so there’s a better chance it will be thought out than if it were some obese 70 minute monster… Thanks for the review. This entry was posted on February 19, 2014 at 7:32 pm and is filed under ALL REVIEWS, N-reviews.You can follow any responses to this entry through the RSS 2.0 feed.You can leave a response, or trackback from your own site.